Today, Deva Dalporto is a YouTube star, racking up millions of page views with videos parodying hit songs. But before Dalporto became a viral sensation, she was a struggling actress—one who cashed out her 401(k) to help support her dream. Dalporto is far from alone. A recent survey of more than 27,000 Americans by the FINRA Investor Education Foundation found that one in ten have taken what are known as hardship withdrawals from their retirement accounts. When you take a distribution from a traditional 401(k)—whether you do it before you reach retirement age or not—you are required to pay income taxes on your withdrawal if you are younger than 59 1/2. Early withdrawals from retirement accounts, including 401(k)s, are generally subject to a 10 percent tax penalty on top of regular income taxes, as mentioned above. For example, if you were to contribute $1,000 a year for 20 years to an investment account with an average annual return of 8 percent, you’d end up with a balance of nearly $50,000, after contributing just $20,000 in total, according to FINRA's savings calculator. Taking a hardship withdrawal not only temporarily halts regular contributions, also but permanently reduces your account balance, and with it interrupting the compounding process. And if your employer offers a 401(k) match, you will likely also forgo that "free money" (and the compounding on it) too. 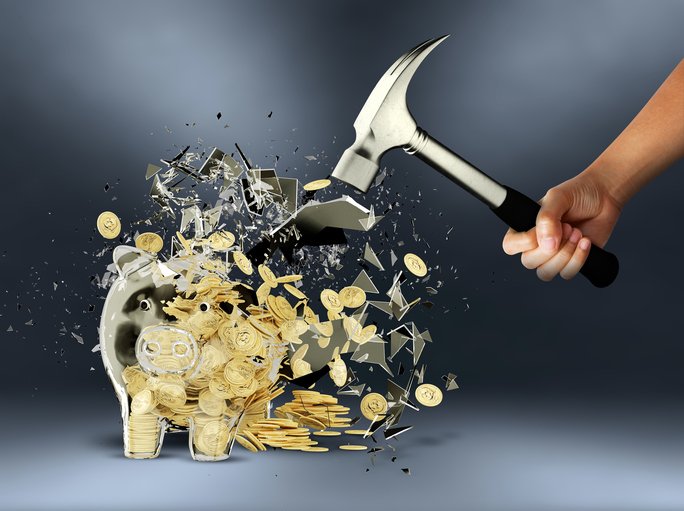 If you don't have an emergency savings account in place before hardship strikes but do have a regular source of income, you may have other options, such as taking out a loan from your 401(k). While such a loan could hamper retirement account growth, borrowers may avoid the stiff tax penalties associated with a hardship withdrawal. Learn more about 401(k) loans here.